It’s been 10 years since my last trip to Tokyo and from memory Tokyo was fairly advanced but perhaps years of deflation has taken the “sparkle” out of the city. I tried to think of one thing you must do in Tokyo but it was just too hard, so instead I’ll share a few places we visited and found enjoyable and hope you will too. Visiting this world famous fish market that has been in operation for around 80 years on 30 December meant big crowds and being pushed along but fortunately coming from Hong Kong we’re use to the crowd. The inner market as you’d expect has all the seafood you can imagine and very old school but unfortunately the government has decided to move the market to more hygienic/modern facilities so for anyone who wants to see this historic market, you better be quick. The outer market features all kinds of traditional Japanese foods and items sold from the street-side stores. Living in Sydney, fresh salmon is readily available so to be honest we couldn’t really taste the difference but gosh the sushi rice was to die for. One of the attractions at Asakusa is the Sensō-ji Buddhist Temple 金龍山浅草寺 with it’s giant red lantern (chōchin 提灯). Entering from Kaminarimon 雷門, you stroll through Nakamise Dori which is a great place to buy souvenirs and try local snacks like senbei (rice crackers )and ningyoyaki (sweet bean cake). We were lucky enough to see a little girl in full traditional costume and took the opportunity to take a photo with her. Apparently hair and make up itself costs a fortune. 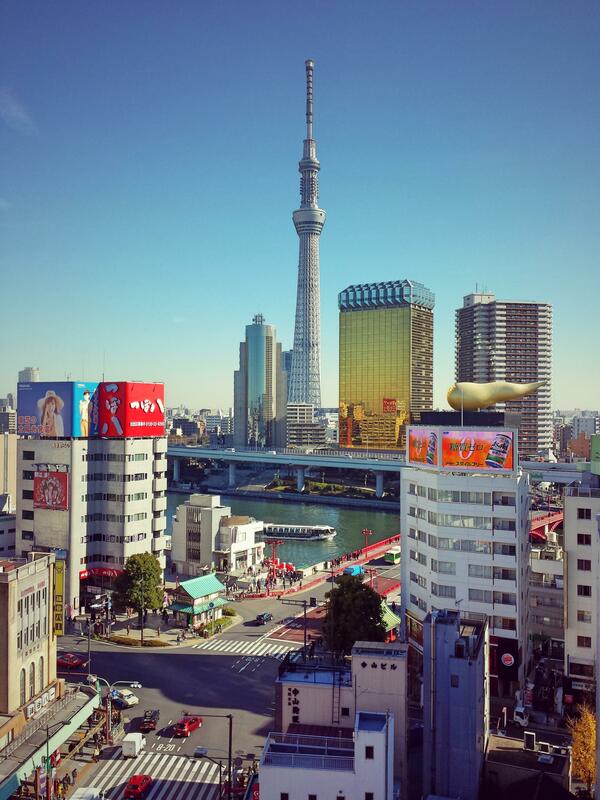 From Asakusa you also get a great view of Tokyo’s Sky Tree. Akihabara is known by the locals as an otaku cultural centre which refers to people with obsessive interests, commonly with anime and manga. It’s also often referred to as ‘electric city’ famous for the numerous discount electrical stores. A number of “Maid Cafes” can be found in the area and having visited one, all I can say is it was certainly an odd experience and not my thing. But before you get the wrong idea, it’s really innocent “fun” where the staff (young girls) dress in costume and try to be kawaii (cute). This neon-lit Shinjuku is quite amazing just as seen in movies/TV and definitely better to visit at night where most shops are opened till 10pm. Home to the busiest train station in the world with over 60 exits and kilometres of underground passage ways leading in all directions, which feels a bit like a maze. Navigating above ground is probably easier, at least you can try and remember landmarks like department store Isetan 伊勢丹. Ginza is an upscale area of Tokyo with numerous department stores, boutiques, coffee houses and restaurants. Most of the European luxury brands operates a cafe in Ginza but we were attracted by Bvlgari’s giant lit-up collier Serpenti. Prices aren’t overly excessive, a cappuccino goes for around AU$10 and a crème brûlée for AU$18 plus service charge, but you get to sit back and enjoy a bit of luxe. 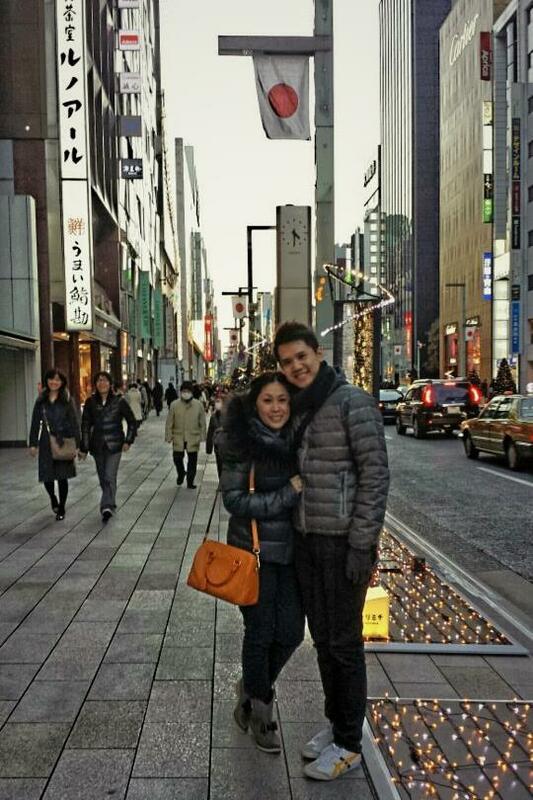 Omotesando is known for its architecturally designed luxury brand flagship stores making it an upscale shopping area. Take a stroll behind the main tree-lined avenue and you’ll find these beautiful houses and condos. As we walked along, we unexpectedly came across Bills by Australian Chef Bill Granger, and what a pleasant surprise. The queue at the restaurant was at least an hour long but as we turned away, we got offered a table on the balcony which most locals shied away from because of the sun. Lucky for us…the food was absolutely amazing and was definitely the highlight for our visit to Omotesando. A large artificial island in Tokyo Bay connected by the Rainbow Bridge from Central Tokyo, Odaiba is a major commercial, residential and leisure area. The view back towards Tokyo’s stunning skyline is breathtaking. You don’t have to go to NYC to see the Statue of Liberty, there’s a replica at Odaiba. The Trick Art Museum is worth a visit and you can take some really funny photos but it takes a while to get use to. The giant Gundam model at DiverCity is super cool, check it out even if you’ve never seen the anime. Shopping in Tokyo may lean towards the more expensive side compared to other Asian cities unless you’re going for local or brands that manufacture in Japan – Burberry is one of them. To get more bang for your buck, try Gotemba Premium Outlet which has over 200 stores near Mt. Fuji, not far from Hakone. Whilst it’s not half as exciting as Woodbury Common in New York, the views of Mt. Fuji does make up for it. Traffic can be pretty bad on busy days so going by train may be a better option than the express bus. So here’re my 8 places of interest in Tokyo and remember to check out my review on the superb Conrad Tokyo. Like many of our trips, we joined a local private tour – The Backstreet Guides which did a fantastic job of showing us around Tokyo including some of the places mentioned above. If you’d like more information on any places, leave me a message.